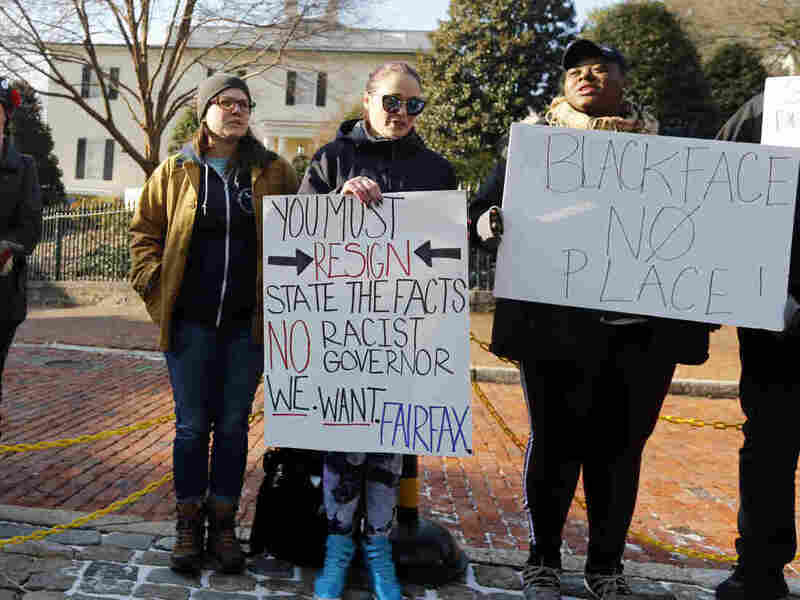 Demonstrators hold signs and chant in Richmond, Va., on Feb. 2, 2019. They were calling for the resignation of Gov. Ralph Northam after a racist photo in his medical school yearbook photo was widely distributed. He denies that he’s the subject of the photo but admits to once dressing blackface. NPR spoke with another doctor, Damon Tweedy, about what message it sends to black patients to hear a prominent doctor tell the country he’s worn blackface. Tweedy is the author of Black Man In a White Coat: A Doctor’s Reflections on Race and Medicine and is an associate professor of psychiatry at Duke University. The debate in Virginia is only one episode in a long history of racism in medicine, Tweedy says. Many African-Americans may feel distrustful of physicians, stemming in part from the legacy of the infamous Tuskeegee syphilis experiments. This distrust has repercussions for the health of black people in America today, who may be less likely to stick with treatments or participate in medical research. Tweedy says he hopes the debate will generate more open conversation about the way bias works its way into the health care system. This extended interview has been edited for clarity and length..
What’s your response to the photo with the guy in blackface, and the other guy in Klansman robes, in a medical school yearbook? The first thought I had was what that might mean for the patients. One of the problems is that if we just sort of make it all about Governor Northam, that in some ways kind of misses the point. Someone had to take that photo, someone had to put that into a yearbook. And you think about it, that medical school was in a community that at the time, even now, was 40 percent African-American. Lay out for me briefly, what is the history of tension between the American medical community and African Americans? It dates back to the beginnings of our country, in some ways. The most famous example in modern times is the Tuskeegee syphilis experiment, which basically was run by the U.S. public health service, and investigated the natural history of syphilis in African-American men. Even after treatment was available, the researchers never notified the men that they had syphilis, or that there was treatment available. It was the most egregious example that we know of. But in some ways it follows a much larger history of concerns, not just in the research realm, but in the clinical realm. It’s very much an oral history among African-American people, you often find that people have a concern or mistrust that they are being experimented upon, or that the medical establishment in some way doesn’t have their best interest at heart. When you were in medical school back in the ’90s, was race ever addressed in the curriculum, or in practical training in your residency? I’m not sure how much he might listen to me, but I’m less interested in the idea of him resigning or not. Regardless of what happens there, he does need to find a way to use his story, not out of self-interest, but in terms of moving forward the conversation in other medical schools and medical settings. How might someone who thinks that they’ve been well-meaning and educated and all that sort of thing, how might they still have made mistakes that could have potentially harmed people?